A reader wrote to say the Modern Jazz Quartet, who featured here this week, does not fall within their concept of classical music. I cannot resist a challenge like that, so here is another recommendation for raga a good bargain. Ravi Shankar made his recordings of Raga Nata Bhairav and Raga Mishra Piloo in the year which was both an Anuus mirabilis and Annus horribilis, 1968. For the sessions the legendary sitar player was joined by Alla Rakha Khan, tabla, and Kamala Chakvravarty, tamboura. Now here is the good news. The morning and evening ragas are available as budget reissues. I actually bought my copy online for £2.99 ($4.43US) delivered. That particular deal is now off the table (tabla? ), but there are some good prices elsewhere. And the money kind of flows the right way. 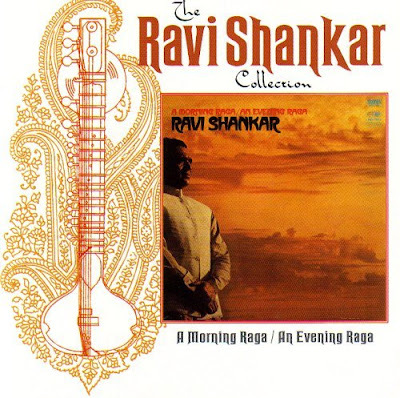 The re-isssue is from the copyright owners Angel Records, as part of their Ravi Shankar Collection. But the original recording was made World Pacific Records label prior to their purchase by EMI in 1979 as part of the United Artists package. If you buy it you may, at least, help my pension prospects. Alla Rakha and Kamala Chakvravarty also played with Ravi Shankar at the legendary 1967 Monterey Pop Festival. There is some atmospheric YouTube footage from Monterey below of the Shankar set, like the MJQ you are either going to love it or hate it. (The set is also available on CD as part of the Ravi Shankar Collection.) You do actually get to see the musicians after seven minutes of the ten minute clip. It was a few years later that Ravi's fans had problem with Eastern tunings. Does Ravi Shankar's collabaration with world music champion Philip Glass fall within the concept of classical music? Whats all this about wrong genres on overgrownpath? Surely the blog is interested in "good" music (within reason - not sure about a feature on death metal), as opposed to "bad" music (go define!). I've learnt loads from the blog and am just working my way through 3 of the Alia Vox book/CD sets I picked up in Palma Mallorca for 25 euros each a couple of weeks ago. Without overgrownpath, I guess I'd never have tried! Just to clarify the above comment. Trilok Gurtu is an Indian tabla player born in Mumbai. I think BT's reference to Turkey was something to do with transport of delight. He is very well worth checking out.